1965 (March 23): Tommaso Squillace was born in Rome. 1971: Squillace moved with his parents to San Mauro Marchesato, Calabria. 1975–1979: As a young boy, Squillace had experiences with the spirits of the deceased and local mediums, which his Catholic parents dismissed as delusions or phenomena caused by the Devil. 1979: At age fourteen, Squillace became skilled in divination through Tarot cards. 1983: Squillace moved to Rome and worked as storeman and extra for movie companies. 1984: Squillace completed his mandatory term in the Italian military. 1985: Squillace discovered Allan Kardec’s The Spirits Book, which would become a decisive influence on his ideas, and became experienced with Rome’s Spiritualist milieu. 1986–1990: After a meeting with an “entity” in Calabria though automatic writing, Squillace traveled repeatedly to Brazil to assist in the production of two documentary movies. He lived with a Brazilian girl and had a daughter by her. 1990: Squillace returned to Rome with his partner and daughter. He worked hard in various capacities to support his family, which left him little time to cultivate his Spiritualist interests. 2013: Squillace was contacted by an agency that hired him to cooperate with a new documentary movie project in Brazil. At the same time, he returned to Spiritualism and met a woman who told him how his tarot card readings had changed her life. 2014: Squillace, now a shop owner in Rome, received from a spiritual entity the order to write a book and its title, Pensa e vai. He started gathering a few friends to discuss the book while it was being written. 2017: Squillace opened Facebook pages for Pensa e vai in Italian and Portuguese. 2018: The book Pensa e vai was published. In the meantime, hundreds, then thousands in both Italy and Brazil, had started meeting weekly for “mentalization” meetings with Squillace, conducted mostly via the Internet. In October, Squillace published his second book, Então Tá, and organized the first international gathering of his followers in Paraty, Brazil. 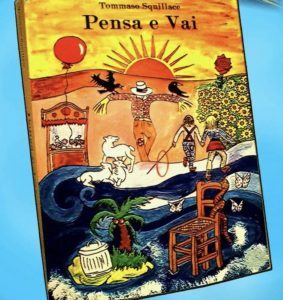 Pensa e vai is a largely informal gathering of several thousand people around the Facebook posts (in both Italian and Portuguese) and a book by the same name written by Rome Spiritualist Tommaso Squillace. 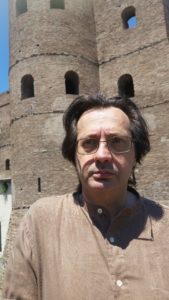 Apart from the growing corpus of Facebook posts (Squillace 2017–), the book Pensa e vai itself, a semi-autobiographical novel (Squillace 2018a), and a collection of poems and meditations (Squillace 2018b), there are no written sources, and this profile is largely based on interviews with Squillace and some of his closest co-workers conducted in Rome and Turin in 2017 and 2018. Tommaso Squillace [Image at right] was born in Rome on March 23, 1965, from Roman Catholic parents who had come to Rome from the Southern Italian region of Calabria. When Tommaso was six, they returned to Calabria, taking the young boy with them to the small town of San Mauro Marchesato, in the province of Crotone. Tommaso enjoyed the relaxed atmosphere of the small village in Calabria, so much different from the chaotic life of Rome. At a very young age, he reported to his parents that he was able to “talk” with his parental grandfather, who had died before Tommaso was born, and with an old lady of the village, also deceased. The parents scolded him for his unbridled fantasy, but finally took him to the local parish priest. Confronted with the vivid details of the visions, uncommon for a young boy, the priest suspected a case of demonic disturbance and just gave Tommaso a blessing. Trying to deliver a message from the spirit of the old lady to one of her relatives was a more traumatic experience. The man did not like the message and beat the young Tommaso mercilessly. Later on, Tommaso started spending time with an old man. He spoke only the local dialect, but in talking with Tommaso, as the latter reported, he spoke in a perfect and even elegant Italian, and expressed deep thoughts. Later, Squillace identified the old man as an “unconscious Spiritualist medium,” and the channel “entities” had selected to deliver messages to the young boy. These phenomena generated in Tommaso a precocious interest for the paranormal. At age fourteen, he bought a Tarot card deck and became quite skilled, and sought after in the village, in predicting the future with the cards. In discussing his early life, however, Squillace quickly dispels the impression that he lived in a fantastic paranormal world of his own. He was a normal young boy and, like many Italians of his age, dreamed to work in Cinecittà, the Italian version of Hollywood, as a director or actor. At age eighteen, he moved back to Rome, and managed to be hired by a Cinecittà company as storeman and jack-of-all-trades. It was not what he had dreamed, but it was a beginning, and eventually he did appear as an extra in some movies. This was 1984, however, and Italy still had compulsory military service for all young men, at age eighteen. Squillace completed it in the Army, only to discover upon his return back to Rome that the movie company was not prepared to offer him stable employment. He had his Tarot cards, and believed he had a natural gift as a Spiritualist medium. He made ends meet by hanging around in Rome’s Spiritualist circles. There, he discovered The Spirits Book by Allan Kardec, the pen name of French schoolteacher and author Hippolyte-Léon-Denizard Rivail (1804–1869), and the Bible of the French branch of Spiritualism known as Spiritism. The book had originally been published in Paris in 1857 (Kardec 1857). Encountering The Spirits Book was crucial for Squillace. All of a sudden, Kardec offered the theoretical framework for his various paranormal experiences. He “felt” that he had to return for a while to San Mauro Marchesato, in Calabria, where in the quiet atmosphere of the small village he received messages from a spirit guide through automatic writing. He was told he should return to Rome, but avoid the Spiritualist groups there, and that one day he would be entrusted himself with a spiritual mission. In Rome, in 1989, he was hired by another movie company to work with them in Brazil. He perceived in this a spiritual message from his guides, as Brazil was the world center of Kardecist Spiritualism. In Brazil, however, Squillace also discovered the darker reality of social injustice and the desperation of the street children (meninos da rua). He started living with a local girl, by whom she had a daughter. In the next few years, he traveled several times to Brazil, trying to work there for projects of Italian movie companies. In these years, he had powerful spiritual experiences both in Italy and Brazil, receiving messages from God himself, but also witnessed a particularly brutal violence against a Brazilian street child. He decided to take his partner and daughter back to Italy. There, he found various jobs to provide for his family but entered what he later called his spiritual “desert.” He still cultivated spiritual interests, but the voices who had spoken to him before remained silent. It was only after more than twenty years of this “desert” that things suddenly began to change again. In 2013, he was offered another opportunity to work for a documentary movie in Brazil (which was successful, although he complains his contribution was not properly acknowledged). He also met a woman who told him how, many years before, the Tarot reading young Squillace had performed for her had changed her life, and all his predictions had come true. The woman told him he should not waste the gift God had given to him. The meeting deeply impressed Squillace, the more so as he had started again acting as a medium, in the hope of contacting recently deceased relatives. He reports he was surprised, as he was not a writer. “What book?” he asked. And the answer came, “The book of your life.” In fact, as it developed along the next three years, the book was not an autobiography, but a of stories, personal accounts, and poems. As soon as he had decided to write it, Squillace started discussing the book [Image at right] with some friends in Rome. Beginning in 2017, he opened pages on Facebook in Italian and Portuguese, the latter for his many Brazilian friends. Even before the publication in 2018 of Pensa e vai (“Think and go,”) as the book was eventually titled by Squillace’s “Voice” itself, groups had started to gather in Rome and Brazil to discuss the author’s ideas and the parts of the book he was gradually releasing. Although some groups meet physically, the Pensa e vai network largely operates electronically. Every week, at a fixed time, hundreds, and now thousands, of followers meet online for half an hour of meditation, and the number is growing. A second book, Então Tá (Squillace 2018b) was published in October 2018. The title refers to an idiomatic expression in Portuguese (“All right, then”) and the book collects poem and meditations. 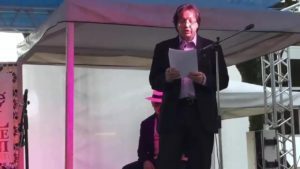 [Image at right] The book was launched in 2018 during the Literary Days of Campos do Jordão, in the Brazilian state of São Paulo. Also in 2018, the first international gathering of Squillace’s followers was organized in Paraty, in the state of Rio de Janeiro, Brazil. The doctrines of Pensa e vai are included in the book, but in an indirect and novelized way. The daily contact with the short sentences Squillace posts on Facebook also socializes his beliefs. What follows, again, is also based on interviews with Squillace himself. As mentioned earlier, the main source of Squillace’s spirituality is the Spiritism of Allan Kardec. However, Squillace does remember his Catholic upbringing, and has read books about Buddhism and other Eastern religions for many years. Squillace’s notion of God is mostly based on Kardec and other Spiritualist sources. There is only one God, but the consciousness of all living beings is a part of God and will return to God. The consciousness (soul) is immortal, while the vehicle (body) is mortal. There are, however, multiple bodies, and of some of these we know very little. Kardec defended reincarnation against other Spiritualists, and so does Squillace. He also believes that chakras are centers of energy in the human body, and kundalini is the divine sparkle present in the human beings. The awakening of the kundalini means that gradually the consciousness has understood its inherent divinity and is now ready to merge with God. In addition to the Eastern narrative of chakras and kundalini, Squillace also adopts the Western and Christian terminology of “faith.” Faith is not something negative, and is in fact necessary for the evolution of the soul. The faith is the consciousness that God exists and that we are all part of God. In this sense, Squillace argues, Christianity is right. There is no spiritual progress without faith. Faith, in fact, enables us to consciously accept and interpret our experiences. Astral travel, Spiritualist seances, channeling are all part of human experiences, but need to be interpreted through faith. The aim of these experiences is not to entertain, but to lead the soul to the union with, or return to, God. Mentalizations last for thirty minutes. A specific time is announced, and followers usually get in touch with Squillace via Facebook, although he believes this is not strictly necessary. Some can simply join the mentalization spiritually. Through meditation focused on creating an “immense energetic current” flowing from Squillace, but fueled by all participants, a beneficial channel of positive energies is generated, and can be directed to followers, those in need who have asked for a special help, or the world in general. Squillace and his followers believe that mentalizations do not simply serve the utilitarian purpose of delivering help and healing, but may gradually transform the whole Planet in a better world. As is typical of a “post-New-Age” spiritual scene in the urban Western world (Heelas 1991, 1996; Helas and Woodhead 2005), Squillace insists that he does not want to establish a “movement” with himself as leader. His is simply a “network” of persons who share experiences and the common aim of creating flows of positive energies to benefit a world that desperately needs them. However, a study of the “mentalizations” shows that participants are not in the same position. Squillace clearly serves at the center. The divine energy flows through him. He insists that he is not the originator of the energy (God is), yet his participation is crucial for the whole exercise, and so far there have not been “mentalizations” without the personal presence and guidance of Squillace. What is presented a network, rather than a movement, clearly has a leader. The “mentalization,” which is the core event linking together the network, largely happens on the Web, although there is a core group of friends and disciples helping Squillace who meet physically in Rome, and others meet in Brazil. Meanwhile, Squillace’s Rome shop has been converted to a library selling his books and small paintings reproducing their illustration. The Rome circle of closer friends also help prepare events, such as the theatrical presentation of the book Pensa e vai Squillace has staged in Turin in May 2018 during the Faiths in Tune festival held in connection with the yearly International Turin Book Fair, [Image at right] and the first international gathering of Squillace’s followers, also organized in 2018, in Paraty, Brazil. Like many similar groups around the world, Pensa e vai faces a dilemma of sorts. It is proud of its non-organization, which it contrasts with the formalism and authoritarianism of other groups. It insists that, apart from the modest sales of books and paintings, no money changes hands and participation in all activities is free. On the other hand, as participants in the mentalizations grew from the hundreds to the thousands, and requests multiply for Squillace to travel, lecture, promote gatherings of his followers and meet them in person, a modicum of organization will in the end be required. But this will transform the spontaneous nature of the present network into something different. 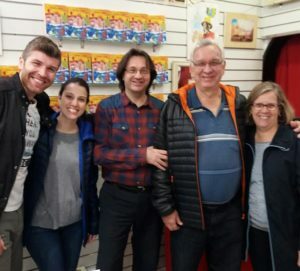 Image #2: Squillace and followers in his old shop, now a store selling his books. Image #3: “The book,” Pensa e vai. 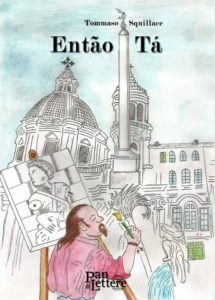 Image #4 : The second book, Então Tá. Image #6: Squillace at the Faith in Tunes festival in Turin, 2018. Kardec, Allan. 1857. Le Livre des Esprits. Paris: Édouard Dentu. Squillace, Tommaso. 2018a. Pensa e vai. Rome: EBS. Squillace, Tommaso. 2018b. Então Tá. Rome: PandiLettere. Squillace, Tommaso. 2017. 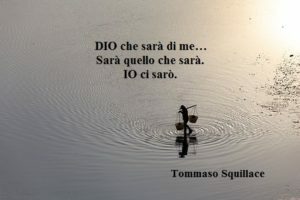 “Pensa e vai—Tommaso Squillace.” Facebook page. Accessed from https://facebook.com/PensaeVai/ on September 22, 2018.